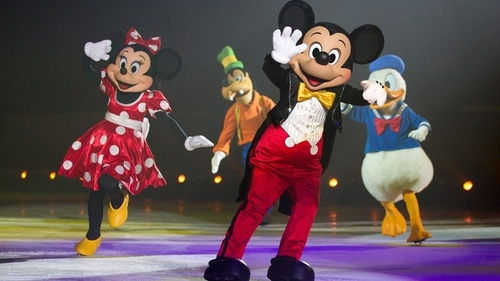 The Wonderful World of Disney on Ice is coming to Ireland in May and John Byrne checked out a recent performance of the show in Birmingham. Why do people refer to something poorly run, or an incompetent person, as 'Mickey Mouse'? It certainly bears no relation to the reality of what goes on in the real Mickey Mouse world created by Walt Disney almost 100 years ago. Originally an animation studio, the Disney brand has mushroomed into a multinational mass media and entertainment conglomerate. These days Disney encompasses brands such as Pixar, 20th Century Fox and Marvel, cable networks including ESPN and National Geographic, as well as many theme parks. There's nothing 'Mickey Mouse' about this operation. The show's due to hit Dublin's Citywest Hotel and Belfast's SSE Arena in May, and it's pretty much got something for everyone as it raids the vast Disney back catalogue from the start to the present day. Shelley Bindon, the show's Performance Director sets the scene. "It's The Wonderful World of Disney on Ice," she explains, "and it's a celebration of some of the classic stories to some of the recent, more hip stories, I guess – the ones that came out more recently. "Snow White and the Seven Dwarfs was the first full-length animated feature film that Disney put out, in 1937. So we like to highlight that. And then we've got the classics like Aladdin, Little Mermaid, then we've got some of the newer stories like Finding Dory, Frozen and Toy Story." The various animated movies are linked together in the show by a story arc that features a quartet of Disney's most enduring characters: Mickey Mouse, Minnie Mouse, Donald Duck and Goofy. They act as narrators. "Mickey, Minnie, Donald and Goofy take us on a journey, looking for the world's greatest treasure," says Bindon. "Each show has its different strengths, the show last year had four stories, while this show has eight. I think it makes it more fast-paced, more entertaining for the audience. "Snow White's a classic, and the kids still know it, and their parents know it. It's multi-generational. This is a perfect family show because the parents grew up with these stories and the kids know the stories, because they've watched them or read them, and they know the new stories because they've been taken to go and see them. So there really is something for everyone." Like almost all of the people behind the scenes at Disney on Ice, Bindon is a former skater and spent ten years performing in various shows, before moving 'upstairs'. And once she starts describing her job as Performance Director, it's clear that she plays a hugely pivotal role. "I watch every show, and then I take notes, both for the performers on their character, singing, all that kind of stuff. The lines in all their numbers – making sure they're guiding and they're looking – so that everything looks good both close-up and far away. "And then also the technical elements, like the lighting, making sure the focuses are in the right spot, stuff that you probably wouldn't notice if you saw the show just once. The sound, the curtains, the props – making sure everything looks the best every night and every show. "I was a performer, and this role kind of just happened," she says, insisting that her current role isn't part of some great career plan. "It's a big learning curve. I've never been a carpenter, or someone who does props, so I've learned a lot. But being a performer, being on the show, you know a lot about the show, and that's been really good. I get to interact with all these performers every day, and we have such a fun time at work, and then you get to put on a show for all these people." The show itself is extremely impressive, and although it boasts some spectacular sets and impressive props, it's really all about the skaters and their ability to mix stunning technique with a desire to perform. The kids around me lapped it up, just as much as the adults. The Frozen segment was greeted with near hysteria. "All of these skaters have been skating since they were little, and trained every day," Bindon explains. "I used to skate five days a week at 4am before going to school, and competed growing up. Most of these people did the same, and skating really is their passion. it's like second nature to them. They wouldn't know what to do if skating wasn't a part of their life. So it really is a joy for them, each and every day. "We all grew up as skaters, but when you join Disney you learn to be a performer – which is different. Because when you're in competition you don't necessarily have to be smiling or singing or whatever – you don't have to project. "That's something we learn in rehearsals. Something I do as a Performance Director is to make sure you're looking to the top row so they can see you; those kind of things. For some people it comes really naturally to be a performer. For some people it doesn't. It takes them a while and you can really see people grow." And although the skaters clearly have a passion for their craft, it doesn't mean that they have it easy. As ever with an operation as slick and seamless as this, it takes a lot of hard work and dedication to get everything just right. And there's no such thing as a night off, either. Bindon runs through the process involved for the skaters in a typical Disney on Ice performance. "We have 49 skaters on the show, and they'd all work every night. Everyone has what's called a show track, showing the numbers they're in during the show. "Then let's say someone got sick or injured, we have people that are swings or spares for certain numbers. So if someone's out they'll do a couple of extra numbers. "But everyone's always in at least some of the show," she adds. "Everyone's very versatile and we have understudies for every role and it's very well backed-up. So the audience will never know the difference. You wouldn't know if you were watching the show and there were ten people sick, or everyone's in the show." The Wonderful World of Disney on Ice is on at Belfast's SSE Arena from May 3-5, and the Citywest Hotel in Dublin from May 10-12. Click here for more movie news.